As an Alfa hotel guest, you have the opportunity to use the fitness, spa and sauna area of our nearby GOLD INN Adrema Hotel. The Adrema Hotel can be easily reached by bus in 10 minutes, or on foot in approx. 15 minutes. Here, we provide you with a recreational area, complete with a direct view of the Spree and everything you’ll need for a relaxing spa day. 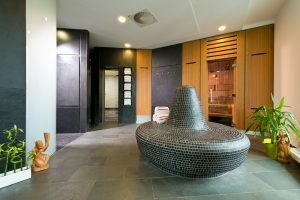 The use of the fitness area is free for hotel guests, while use of the sauna costs a one-off €10 fee per person, which enables you to use the sauna for the entirety of your stay. A day pass for visitors not staying at the hotel costs €15 (spa and fitness inclusive). Please contact our reception staff, we will be happy to help further.